Welcome to Open Awareness Buddhist Center! The Open Awareness Buddhist Center is a place of refuge and sanctuary for all beings. The Sangha of Open Awareness is a fellowship of practitioners who are committed to ethics, honesty, respect for all, and to providing a welcoming atmosphere with the pure intention of benefiting sentient beings through Dharma activities. These include the gathering of merit and wisdom, sharing the teachings of the Buddhadharma, and meditating – all as taught in the Tibetan traditions. 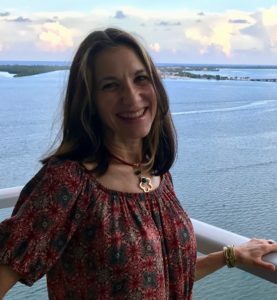 Lama Karma Chötso and Susan Howell, the owner of FinReFinFree (Financial Responsibility = Financial Freedom) will be teaching Women, Money, and Meditation, a class that helps take the stress, worry, and fear out of money matters and brings in peace, calm, and freedom. This particular class is for women only and will focus on learning some of the key ways to control your money instead of it controlling you! Click on the link below to see our full calendar of events. Lama Karma Chötso began to study and practice the Kagyu Lineage of Tibetan Buddhism in March, 1982 after meeting Dorje Chang Kalu Rinpoche in New York City when he gave the Kalachakra empowerment. She took refuge with him there and 4 years later he ordained her as a novice nun. Lama Karma Chötso entered the three-year, three-month retreat, a meditation retreat held in strict seclusion, in 1986 and completed the retreat in 1990. 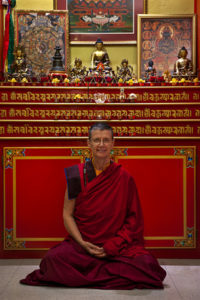 Lama Karma Chötso has practiced the Buddhadharma for 35 years. She studied Madhyamaka under the guidance of Khenpo Tsultrim Gyamtso Rinpoche for many years and her teachings reflect this. 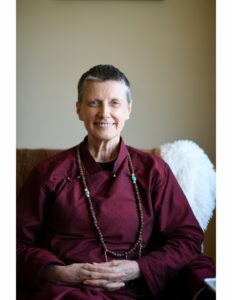 She also teaches extensively on instructions in Vajrayana practices, Tibetan language, and she is trained in thangka painting. 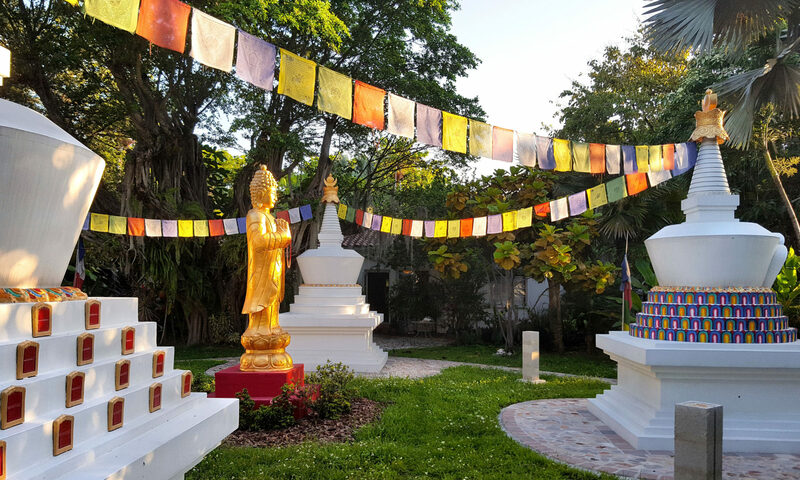 Our Sangha is very active in the South Florida community. Dharma practice at the Residence flourishes as members participate in a variety of programs and activities. The Sangha members provide powerful support to one another on the spiritual path. Membership dues also provide financial support to Open Awareness Buddhist Center’s ongoing projects and members enjoy discounts to multiple events. Open Awareness Buddhist Center invites every person seeking refuge in the Buddha’s teachings of wisdom and compassion to practice with our Sangha. You are welcome regardless of racial or ethnic background. You are welcome regardless of your faith. You are welcome regardless of your age, education, or preferred language. You are welcome regardless of your gender or sexual orientation. You are welcome regardless of your political affiliations. You are welcome regardless of your abilities or disabilities. Individually and as a sangha, we vow to respond to ignorance, hatred, and oppression with skillful means and loving kindness in order to end the suffering of all sentient beings. 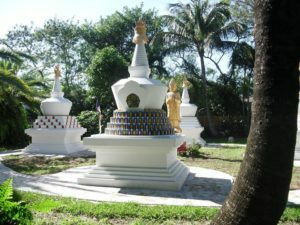 The garden of the Open Awareness Buddhist Center, called “The Stupa Garden of Merit”, opens onto the Miami Little River that flows with the tides. The garden, with four (4) large stupas, paths for circumambulation, and surrounded by beautiful trees and flowers, is a place of tranquility, peace and beauty available to everyone. Open Awareness continues a 20-year tradition of chanting practices and meditations along with the weekly offering of traditional Tibetan butterlamps. Please see our calendar to choose the events you’d like to attend. You will always be welcome. First Light is a ceremony to welcome in the New Year of 2019 with the lighting of over one hundred traditional Tibetan butterlamps. Chanting will include the practices of Green Tara, Medicine Buddha and Fire Puja along with prayers for peace, harmony and an end to violence. Begins at 9 a.m.